This past Sunday I get a call at about 11am from the emergency service that my 94-year-old mother is subscribed to. “Your mother fell and an ambulance has been dispatched. Your sister Annette and brother Richard have been called and Richard is on his way to your mother now.” That’s a call we all knew we would get, but you are never prepared for something like that. I knew my brother Richard was 10 minutes away from my mom, so I waited a while before I called him to find out how serious it was. About a half hour later I heard the news, and it wasn’t good. “Mom is in the emergency room, she broke her hip, had heart failure and has water in her lungs”, my brother said. It sounded like the end would be near. A broken hip for any elderly person is a death knell. I told my brother I would head to Long Island and see him as soon as I can. After fighting weekend beach traffic for 2 hours, I’m about 10 minutes away from the hospital and I called my brother. “Pete, now they are telling me she didn’t break her hip”, my brother said. “She’s still in ICU and they are trying to clear the water from her lungs and treat the pneumonia. At least there is some good news!” I was glad to hear that, and also glad I was about to see her, because I’m sure in her state nothing is more important than being together with family. I get to my mother’s room and my sister in law Lillian is there. I greet her and get the run down as to what is happening. They have her hooked up to oxygen with a full face mask and are giving her antibiotics intravenously. She has been on morphine pain killers most of the day so she was drifting in and out of sleep. As I’m sitting at the foot of her bed, with my son Joseph by her side, she begins to open her eyes and slowly come out of her sleep state. I was holding her hand and called out to her, “Mom!, it’s me Peter! How are you feeling?” She started to open her eyes and was responding to my voice. I saw that her eyes began focusing in on me sitting at the foot of her bed. As her frail, shaky hand moved up to her oxygen face mask she moved it below her chin so she could talk. She spoke what was probably her first words of the day after her accident. I’m sure Italian mothers are not the only parents that lead a needy and all-consuming life with their children. There is plenty of guilt to go around in other ethnic groups. But I did what any good son would do when his mother was in need…be by her side. And I was glad to hear the words, “I’m not ready to die”. I’ll keep her as long as our Good Lord is willing to let us have her. My mother or grandmother never made Bolognese Sauce. At least they didn’t call it that. My mother made a meat sauce that was similar to Bolognese but not quite the same. 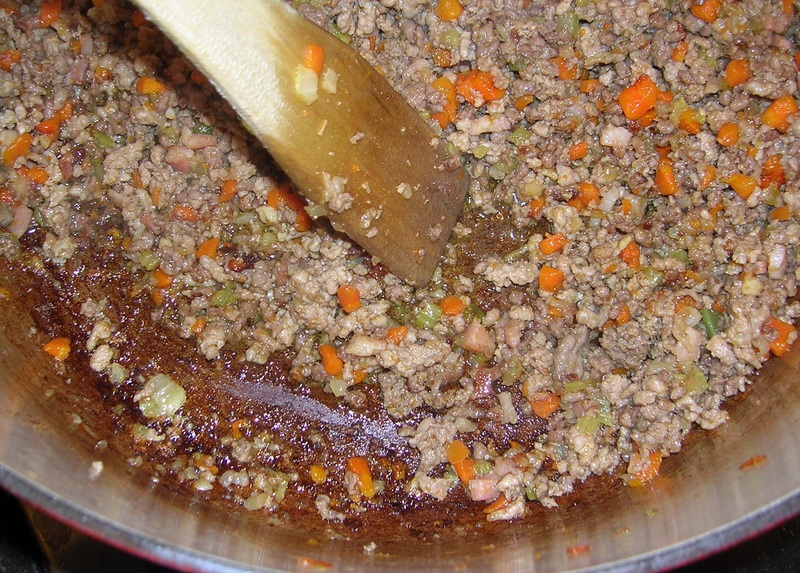 Bolognese sauce originated from the town of Bologna, Italy. Bologna is in the north. Quite a way from Sicily. 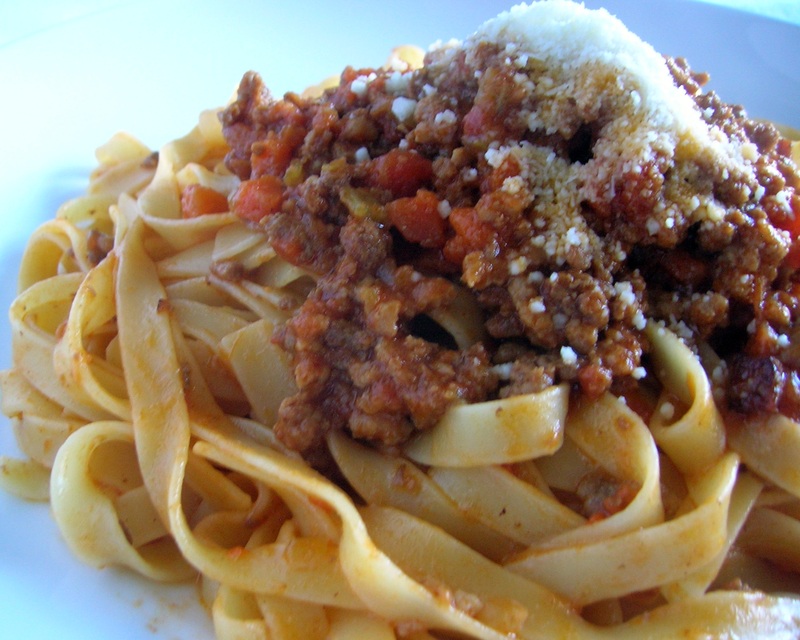 This Bolognese sauce is intense with flavor. The secret is cooking out most of the moisture in the vegetable and browning the meat to the point of carmelization before adding the tomato sauce. It’s important that the onions, celery and carrots are all finely and evenly diced. That way they cook more uniform, adding a better texture to the sauce. You don’t want large chunks of these veggies sticking out. Place a large, heavy saucepan over medium heat and melt the butter in the oil. 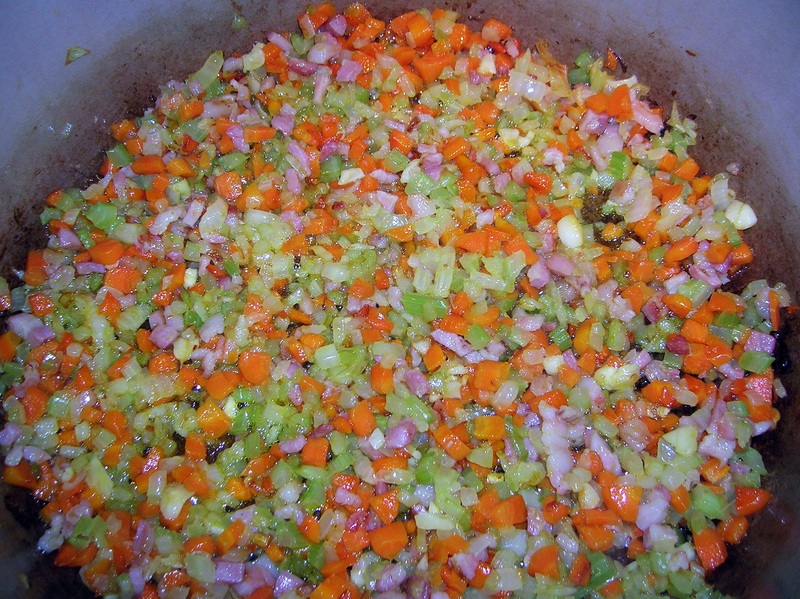 Add the onion, carrot, celery and garlic with a good pinch of salt and sauté for 5 minutes, stirring often. 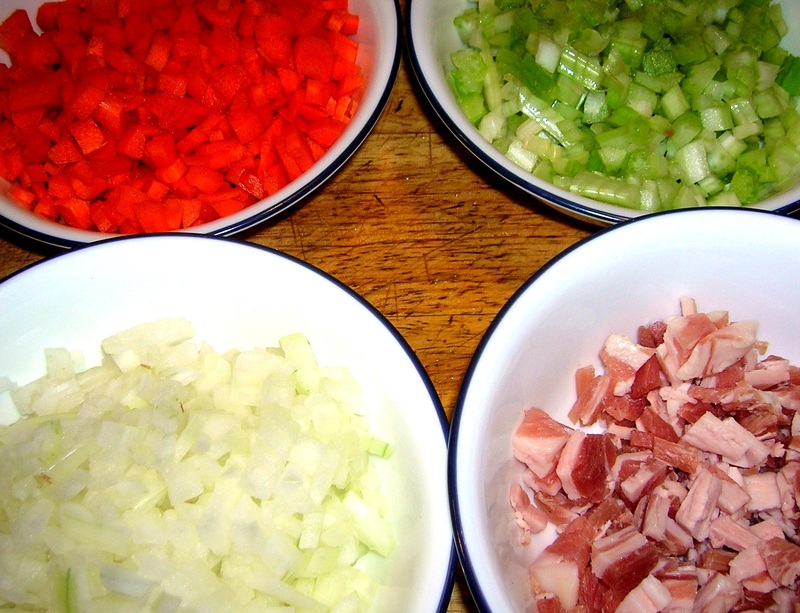 Add the diced pancetta and cook for another 10 minutes, until vegetables are softened and pancetta is golden. Turn the heat up high and add to the vegetables half of the chopped meat. Brown the meat by breaking up the large chunks with your spoon. Once the first half is browned add the remainder of the meat and brown at least 15 minutes over high heat. Stirring occasionally. You want the meat to carmelize. Be careful not to burn the meat, but carmelize it so that some of the meat even gets crispy. Deglaze the pot with the white wine, stirring up the little brown pieces that stick to the bottom of the pot. Before all the wine evaporates and the meat starts sticking to the pot again, add the tomatoes, milk and beef stock. Stir well and bring to a boil. Reduce the heat to the lowest setting you have and simmer half covered for at least 2 1/2 hours. Make sure to stir the sauce from time to time and especially more often at the end of the cooking cycle to keep from burning. The sauce should be thick and glossy with oil with most of the moisture and liquid evaporated. Cook your pasta and place back in the pot and mix in a couple of ladles of the sauce. Serve immediately with additional sauce on top with plenty of grated Parmigiano Reggiano cheese. 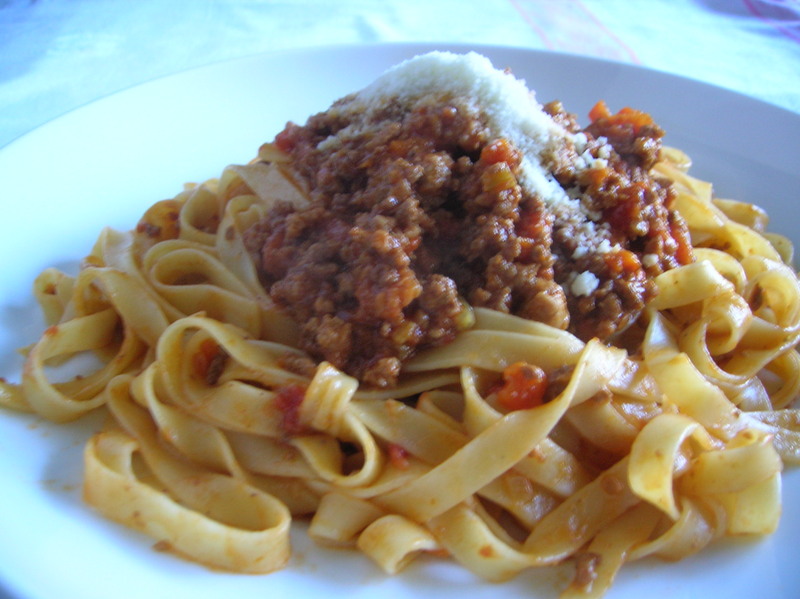 This entry was posted in Beef, Pasta and tagged Bolognese sauce, ragu Bolognese. Bookmark the permalink. Peter I was saddened to read of your mother’s fall. I was just recently discussing you and this recipe! Wishing your mother a fast and full recovery.God Bless and be well.You are a good son !!! Thank you Karen. You inspired me to post the real thing. All the best! Hi Peter, just a quick note to see how your mother is doing….hopefully she’s on the mend. You didn’t forget to give her that kiss now did you ? LOL Wishing you and your family all the best ! Mom is in rehab doing well. Thank you for asking! Good Morning…I have written to you before letting you know how much a I enjoy your recipes and your blog. First, I hope your Mom is doing better. I lost my mother at 14, so I am envious that you stil have yours..enjoy the guilt!. 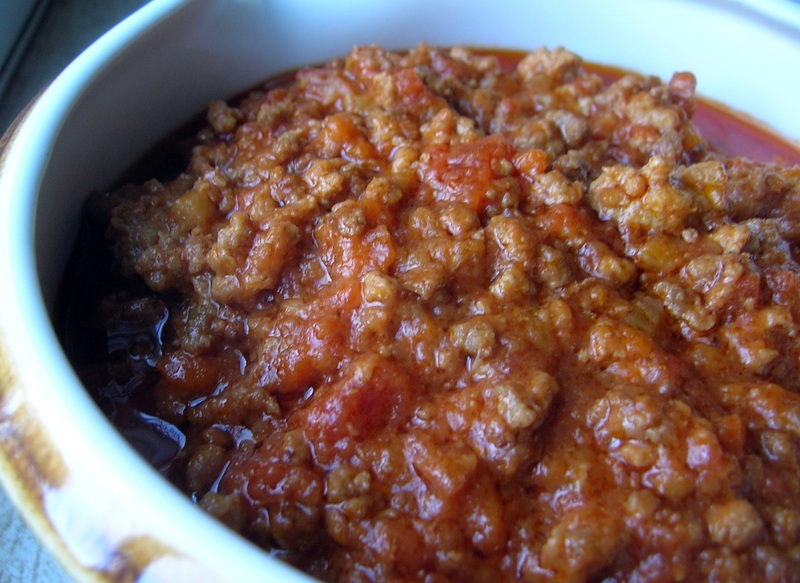 Love this recipe..I have been looking for an authenitic “meat” sauce…and you never fail to deliver…Thank you…and again, thank you for keeping a piece of my childhood alive!.. Maria, thank you for your kind words. Hi Peter, Learning about you and your Mom and family always is a hug in the heart. You make me feel like I’m part of the family. In my Italian family, I’m “the older family” now and boy do I ever miss the guilt trips. How come I missed out learning to deliver that guilt like your Mom does? Maybe I do it …and I don’t know about it??? Or does it skip a generation and my kids will be the ones to give out the guilt trips???? Sure hope so! I’ve never eaten this sauce before. Will have to try it. The thought of putting all those veggies in with Milk and tomatoes…. is new to me. I will let you know how it goes over with my family. Please send your Mom happy greetings from one of her son’s fans. Without her, we wouldn’t have you. Louise, try this sauce. You will love it! Love never skips a generation…it’s always there. SMILING………………. of courses, —- another word for guilt —– is ! LOVE ! HAPPY 4TH OF JULY…… THANKFUL OUR PARENTS CAME TO AMERICA…. Marianna, spunky and mouthy is an understatement! We love her dearly! As far as this sauce, no curdle here. Try it, I know you will love it. Prayers continue for your mother. Have nto tried this recipe yet; Why? I’m still working through shingles. Hope everyone out there 60 and older got their SHINGLES VACCINATION. Unfortunately I had not. My husband is vaccinated now; I will be at the proper time. Thank You Louise. Hope you’re doing better as well. Hello Peter,hope you & your family are well.If you can,can you please post a recipe for Eggplant Parm? Every time I make it it comes out too liquidy.I salt & drain the Eggplant first.What am I doing wrong? Also wishing your Mom the best! I like pasta al ragù. Thanks Alberto. Yes, she is doing fine. Followed you here through your FB posting to John Pinette… this is a very similar bolognese recipe to my own, which (if I may say) is quite delicious! The one major difference between them is my use of tomato paste where you add milk. I’m not claiming mine is better, just offering you a variation. 🙂 Keep up the great site! Cooking is always a work in progress. I’m always open to new things. Thanks. Hello Peter, hope your well ! Can I make this sauce in advance and keep it in the fridge for a day or two? I’d like to make it for a dinner party but don’t want to be stuck in the kitchen making this with guests here. Thanks ! Karen, this sauce is great the next day or two. The flavors just get better. Just be careful when you heat it up that you don’t burn the bottom. Stir often.